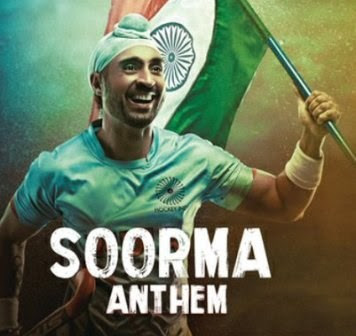 The power packed and awe-inspiring title track of the much-awaited film #Soorma is here and it is one of the best Anthem songs in recent times! This electrifying anthem has been voiced by Shankar Mahadevan and penned by none other than Gulzar. The song depicts the struggle and resilience of a player, who against all odds, rose to name, fame, and pride of the nation. The film Soorma is based on the life and times of hockey player Sandeep Singh, Diljit Dosanjh plays the lead role. The story chronicles the life and struggle of Sandeep becoming national champion but due to a tragic accident, he gets paralyzed and bounces back through sheer determination and spirit. Soorma stars Diljit Dosanjh, Taapsee Pannu, and Angad Bedi. The film is produced by Sony Pictures Networks Productions, Chitrangda Singh, and Deepak Singh, Soorma is written and directed by Shaad Ali with music by Shankar Ehsaan Loy and lyrics by Gulzar. The movie releases on 13th July 2018.